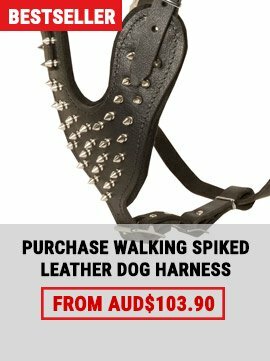 - Adjustable in 5 ways to give your dog the best fit. 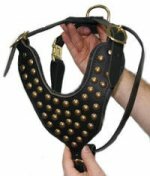 This harness has a special no-choke design . 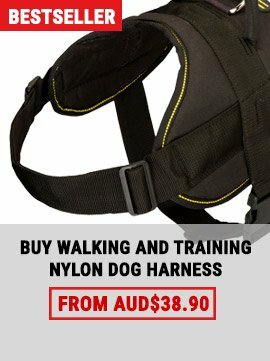 The travel harness and general exercise harness in one! The Hi Control Safety Harness is easy to fit and easy to use, adapting from a travel harness to a walking harness with no effort. Large, to suit labradors and other dogs of similar size. 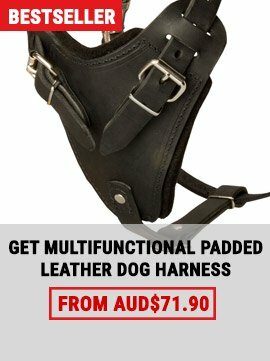 Once all straps are adjusted, the dog harness can be quickly put on the dog by using only one buckle and strap.This harness is handmade from high quality, heavy duty strong leather.It is flexible and will not rub or wear into the skin of your dog. 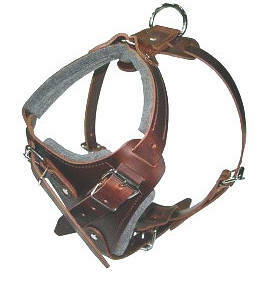 Designed so the resistance is on the shoulders and not on the throat our leather harness allows dogs to bark and track in free way and still be restrained enough.Straps are 1 1/4 " wide, and assembled using capped rivets for extra durability.Made of finest quality soft and strong leather with solid nickel buckles and rings that won't rust for long life.D ring is stitched and rivetted so it won't pull out.